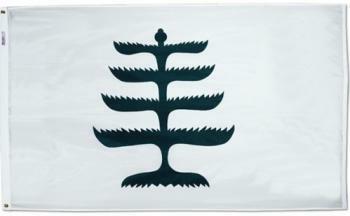 3x5' Pine Tree flag. This nylon flag is digitally dyed for excellent outdoor performance and durability. The flag comes with the standard canvas header and brass grommets and feature four rows of lock stitching on the fly end. Try a historical flag from All Star Flags. The Pine Tree Flag was used in similar fashion as the Washington's Cruisers flag. It is derived from the 1775-1777 time period as was primarily used as a naval symbol for ships on the Charles River. The Pine Tree symbol was popular during the Revolutionary period and was featured on a number of flags including: Bunker Hill Flag, Continental Flag, PIne Tree Flag, and Washington's Cruisers Flag.